The Bluetooth Wireless Serial Port adapter is the ideal solution to instantly go from cabled to wireless on any rs232 link. Use it to connect all types of devices such as serial printers, serial scanners, or any other serial device to a computer or remote up to 300+ feet (100 meters) away. Wireless serial cable replacement $179.95 a pair. Everything you need to setup a wireless serial link is included in the box. No hidden charges for optional components. 2 - USB power cables (for drawing power off USB port). 2 - AC power supplies (for using AC power instead of USB). 2 - 9 pin gender changers. The Bluetooth Wireless Serial Port adapter (BTR-RS232) is the ideal serial cable replacement. Use it to connect serial printers, serial scanners, or any other serial device to a computer or remote up to 300+ feet (100 meters) away. This Wireless Serial Port does not require a computer to function. After it is configured simply plug in and it is ready to work. The Bluetooth Wireless Serial Port Adapter can be used with PDAs, computers, laptops, and smart phones that support the Bluetooth Serial Port Profile and Bluetooth Generic Access Profile. As such, this wireless serial port adapter is ideal for use in applications where a PDA or laptop would communicate with another device (SBC, RTU, sensor, robot, radio, PBX) wirelessly. 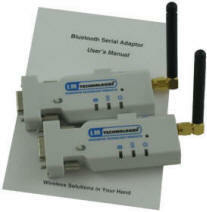 The Bluetooth Wireless Serial Port Adapter can be used in multipoint configurations as well. Any number of these adapters can be used to connect a computer to many other devices. 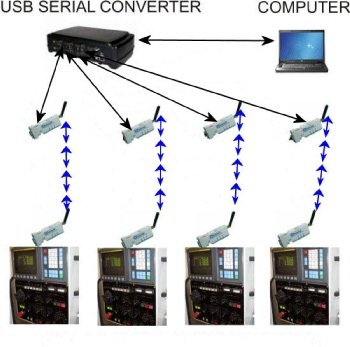 In its basic configuration you can use these wireless serial port adapters to connect two rs232 devices without the need for cabling. The wireless serial adapters are connected directly to the communicating device via a 9 pin port and the pairs can communicate over a distance of 320 ft. Besides a simple one to one wireless connection you can also utilize these adapters to create more complex wireless communications links. As shown in the diagram to the right you can utilize a multi port card or USB-RS232 converter to communicate with multiple wireless pairs. In this scenario each Bluetooth wireless serial adapter is connected to one port on a multi-port card and is paired with another wireless adapter. 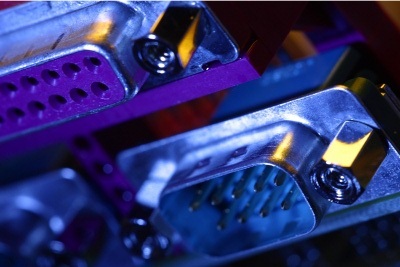 The computer is then able to communicate to each wireless link on a separate communications port allowing for sending/receiving data from multiple wireless links at the same time. Please note you need to utilize a multi-port adapter to achieve this design.